← HIGHLY RECOMMENDED. 2009 Gen5 Cabernet Sauvignon (85% Cabernet Sauvignon, 8% Merlot, 4% Petit Verdot, 3% Malbec), Lodi, CA. 13.9%, $12. 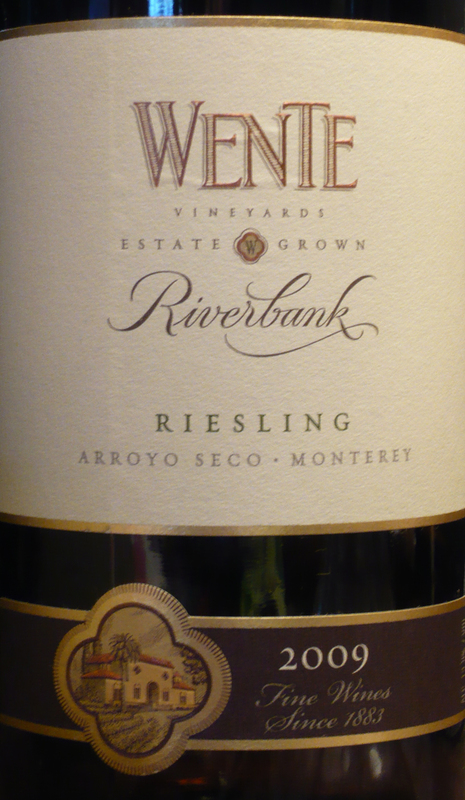 RECOMMENDED: Wente Vineyards Estate Grown, 2009 “Riverbank” Riesling, Arroyo Seco / Monterey. 13% ABV. $11.99, available for as little as $8.95 online. APPEARANCE: Pale golden, clear. Still. NOSE: Mild. Melon, a hint of ginger! Later, huge apple aromas. TASTE/MOUTHFEEL: Lychee, melons, slightly sweet. A thread of ale. Oval at first, more vertical later, but beautifully balanced. Honey. Later, more stone—funny! Usually we pick up on the stone/minerals at the start. A surprisingly velvety, weighty mouthfeel. LABEL NOTES: Wente Vineyards, established in 1883, is the country’s oldest continuously operated family-owned winery. Our Riverbank Riesling is Estate Grown along the banks of the Arroyo Seco River in Arroyo Seco, Monterey. The Wente family sustainably farms nearly 700 acres of vineyards in this region, where the long, cool growing season and gravelly soils produce extraordinary Rieslings with classic flavors of red apple, spice, and perfectly balanced acidity and sweetness for an excellent mouthfeel. Enjoy. VINEYARD: The Arroyo Seco Appellation is defined by a unique geological feature called the Arroyo Seco Cone. Composed of soils, water sources, and wind streams that differentiate it from the Salinas Valley and the Monterey Appellation, it was created over eons by the flow of the Arroyo Seco as it spills down from the Santa Lucia Mountains. This funnel-shaped region appears at the edge of steep slopes where the river has cut a deep ravine, forming an imposing riverbank. On the southern edge of this ravine, Riesling flourishes in the deep rocky soils. FERMENTATION: The grapes were cold fermented in stainless steel. Fermentation at lower temperatures highlights the natural fruit flavors in the grapes. The wine did not go through malolactic fermentation, helping to retain its crisp acidity. AGING: The wine was aged in stainless steel tanks. For more information on the winery’s history and sustainability practices, and their other wines, please visit http://www.thefrugalwinesnob.com/?p=758 (2010 “Morning Fog” Chardonnay), http://www.thefrugalwinesnob.com/?p=1004 (2009 “Sandstone” Merlot), and http://www.thefrugalwinesnob.com/?p=1008 (2009 “Southern Hills” Cabernet Sauvignon). This entry was posted in California, Riesling. Bookmark the permalink. 2 Responses to RECOMMENDED: Wente Vineyards Estate Grown, 2009 “Riverbank” Riesling, Arroyo Seco / Monterey. 13% ABV. $11.99, available for as little as $8.95 online. Interesting how you can differentiate all the different tastes in a wine. I am working on it, but still am not quite there yet. Sounds like a good wine to hone my tasting talents with. Aw! Don’t sell yourself short. You have a lovely blog, and as you wrote, you “use colors to describe tastes” and why NOT use sounds and visuals? It is often really difficult to explain just what “that” taste is, so wine wheels come in handy. When I haven’t known what something on the wine wheel was (i.e., lychee) I took the opportunity to taste some the next time we hit the Oriental buffet. I like to use musical analogies sometimes as comparisons — some wines are bright, high and clear, like a good soprano, and others are dusky like a baritone. Love when images come to mind, and into the review they go. A couple of the wines we’ve tasted I’ve described as “all dressed up and ready to go to the opera,” and one of the Rieslings was like “that woman you meet at the bar who seems very reserved and when she shares her secrets she is warm and wonderful, and she turns out to be a princess” or something like that. I’ve learned a lot from tasting with other people, too. Anyhow, the wine words are kind of industry-wide accepted standards, and the first time I experienced bacon in a wine I was astonished. I’ve tasted creosote, which oddly enough was not unpleasant. And so on. Whatever sensations and associations float (or fly!) into your mind, go with ’em and enjoy — that’s what it’s all about!